Sorry, this Claddagh wall cross is now sold out. This Celtic wall cross includes the words that symbolize the Claddagh; Love, Loyalty and Friendship. 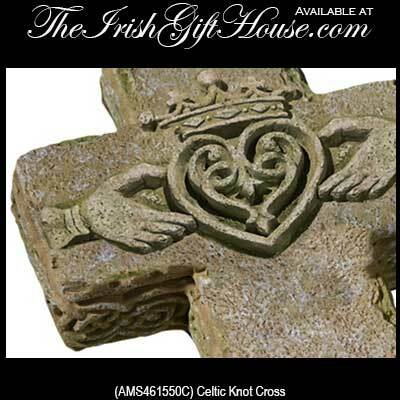 This Celtic wall cross features the Claddagh symbol along with embossed around the sides. 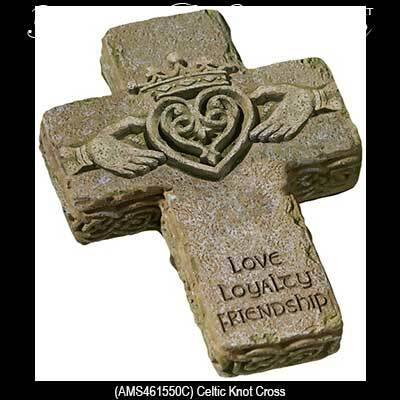 The Claddagh cross is made of weather resistant cement and resin combination that suitable for outdoor use and measures 3 1/4” wide x 4 1/2” tall. This Irish wall cross is gift boxed with Celtic knot and Celtic cross history cards along with the Claddagh legend card, complements of The Irish Gift House.